I'm not sure why this movie bombed. I would guess because people were hearing too much about the middle east through the news so they didn't want to pay $8 to see even more bad news. Well cast (except for Garner), well acted, compelling plot, interesting locations and a lot of action. All great ingredients for a good movie. Perhaps this movie played loosely with facts and reality, I really can't say, but as an American movie it didn't have any gaping plot holes. Just like Rambo II, but instead of heinous and retarded Vietnamese killed by the hundreds with no friendly losses, you've got heinous and retarded Arabs killed by the hundreds with no friendly losses. Your usual FTP with cheats. Visceral as it may be, Peter Berg's "The Kingdom" employs an absurd premise: That a terrorist attack on American oil workers in Saudi Arabia would allow for a character-driven, small-ensemble hunt for the ringleader to ensue in the midst of crowded markets and impromptu prayer sessions. Hogwash; such a thing would trigger a Saudi lock down so swift and fierce that said investigation would play out amidst deserted streets and silence. The remaining American workers and their families would be whisked "out country" in hours. A grieving Tim McGraw, stumbling around in a base house near the bomb site two days after the deed? Please. It'd be easier to suspend belief if Berg and screenwriter Matthew Michael Carnahan weren't so intent on imposing the facts of the US-Saudi relationship - true, but obvious and meant to impress - in the movie's opening credits. Or using title placards to identify characters, documentary-style. Or fixating on the supposed efficiency and forensic genius of an elite four-person FBI team, led by Jamie Foxx, who basically wears shades, growls and plays cool until the half-hour gun battle right out of Michael Mann's playbook. A grainy film stock can't obscure a rudderless police procedural in which the bad guys finally intervene on behalf of the good ones so the movie can end in a rush of blood. Foxx is Ronald Fleury, an FBI investigator whose team of snoops includes grizzled Grant Sykes (Chris Cooper), a token, braver-than-thou female in Janet Mayes (Jennifer Garner) and, yeah, comic relief in Adam Leavitt (Jason Bateman). Levity? Get it? Nebbish whining from a geek in the wake of a terrorist attack? Tastes like dry Strawberry Quik, especially when the geek becomes distressed damsel, and is saved twice from a beheading. Once by a faulty camera tripod. You cannot imagine a more unlikely foursome. Fortunately, Carnahan's script provides a Saudi cop (Ashraf Barhom from "Paradise Now") whose "rules" forbid the FBI from doing much. "The Kingdom" has an interminable second act in which Fleury's gang seeks the identity of someone the audience has already met, through means that will not get them particularly close. Indeed, the team seems to fall short, until a bit of serendipitous violence - it can't be called anything else - drags our intrepids straight to the rocket-infested lair. What's left? A meandering travelogue? "The Kingdom" knows some things about Saudi Arabia, and even has the sense to compare and contrast cultures, but it underlines these critiques in a preening, know-it-all way that Berg brings to his work. Berg's camera flits about the chaos before zeroing in, over and over, for that just-so line of poignancy - only he does it with varying shot widths, which, in its own way, is just as ridiculous as all those slap-dash, get-a-car-crash-from-12 angles films in the 1980s. Berg's mentor, Mann, falls into that trap occasionally - see "Ali" - but not like this. I think this movie is another great movie staring Jamie Foxx. It took a while for it to start but eventually you'll figure out where the movie is going. I recomend at least watching it once. Why is it that the Middle East is such a hotbed for war, strife and death? Look back into history. Religion is the main reason for so much hatred and death. It's at the heart of the Crusades, the witch trials and burnings, even in today's headlines with the terrorist attacks and other atrocities. The bare bones basics of religion are control. It's a means to keep the masses in line. The other, the better aspect of religion is that it gives people something to believe in. It brings comfort to many people in their darkest hours. Without something to believe, many people would just give up all hope. It's a horrible fact that there are fanatics out there who believe that their religion is the only way, all other belief, no matter how benign, is wrong and those who practice it don't deserve to live. These very same fanatics also believe that the end justifies the means. They don't care how much blood is shed as long as what they expect, what they demand, comes about. So, many of these terrorist leaders have their own agendas, and they use true believers as pawns, using their faith so that they will execute their orders, wrongly thinking that they are doing god's duty. So, we have the movie the Kingdom. It's about terrorists and investigations, trying to get to the heart of what seems to be nothing more than senseless slaughter. It starts out slow, and to be honest, it was quite heart breaking to see innocent people - mothers, children, families, mowed down by terrorists. This brings up the question yet again... Why is there so much hate in the world? That's Why must people kill in the name of god, and then go on talking about god's mercy and peace? You can't slaughter people and then preach about peace, it's just not possible. After the terrorist attack takes place, FBI agents sent to Saudi Arabia in order to investigate it, since it took place inside an American workers compound. At first, they're met with exceptional resistance. The local authorities don't want them there, the American government didn't sanction the mission. They quickly become targets. It's slow at first, but the action builds to (pun intended) an explosive climax. The last twenty minutes are very intense. Hell, lets be honest, the last twenty minutes of the movie is the best part of it! The movie does give the viewer a very brief glimpse into the culture of the Middle East, and even generates one of the most entertaining lines of the entire film in regards to Jennifer Garner's character! I found that the cast had real chemistry. They all meshed well together. Jennifer Garner almost seems to be getting typecast playing a member of the FBI. Although it seems that he is best known for his comedic roles, Jamie Fox once again shows that he can be a serious actor in this movie. He had real onscreen charisma. Jason Bateman, having grown up on the small screen and is probably best recognized today for the role he played in Arrested Development plays one of the members of the team sent over to investigate. To me, his character seemed to be more for comic relief, but even though he was a welcome addition to the cast. For me, one of the best parts of the movie was the relationship that developed into friendship between Jamie Foxes character and Colonel Faris Al Ghazi (portrayed by Ashraf Barhom). It showed that despite cultural differences, people can build trust and even friendship while learning to work together. The disk has its usual commentary track with director Peter Berg that you can listen to while watching, 3 deleted scenes, 3 featurettes (constructing the freeway sequence, creating the kingdom & history of the kingdom: an interactive timeline). Finally, the best bonus feature in my humble opinion was Character by Character: The apartment shootout that shows the last action sequence from the different characters point of view. This movie was exceptionally well done, albeit a little slow at the start, and it's worth watching. I just rented the Unbox version. I had read some good reviews here, but as the movie unfolded I was relieved that it was as good as people had said. This really was a non-political movie. Walked away with little insight .... but a great emotional ride. I just finished watching this... and it was powerful. Not very educational but the struggles in each characters life is heart felt. I was very upset at the death of a particular officer towards the end. I guess it goes to show that war is never ending. It is wired into human nature and though our emotions are so resistant....it is a given fact of the laws of survival. But all we are saying ...is give peace a chance. If you like action flicks with exploding cars and more bullets flying than in some wars, then you'll enjoy this film. The basic plot is good and the actors are talented. However, two major flaws may spoil your enjoyment. The first is driven a genre that demands violence, violence and more violence. Its FBI agents are more like Rambo than real agents. They're too proficient at street combat with automatic weapons to be believable, and they're too obsessed with a revenge-filled "killing them all" to be real pros. Good investigators don't gun down the little guys in a crime. They use them to get to the big guys. The second problem is more serious. Hollywood--in this case Universal Pictures--is absolute terrified by terrorism and it shows in the films they are producing. Illustrating that the bully and coward often inhabit the same skin, the film's bullying bloat of violence closes with a cowardly pairing of scenes where the terrorist's murder of children on a playground is equated to the FBI's pursuit of terrorists. It's Hollywood's way of saying to terrorists, "Blow up a school or a subway, but leave us alone. We're harmless." More worthless than harmless, I'd say. Imagine a film like Patton closing with scenes that equate the U.S. Third Army crossing the Rhine with the the Nazi S.S. at the Dachau concentration camp, and you get a taste of just how foul-smelling the ending to this film is. the HD DVD WAS LIKE IN NEW CONDITION AND DID NOT HAVE A SCRATCH ON IT !!! 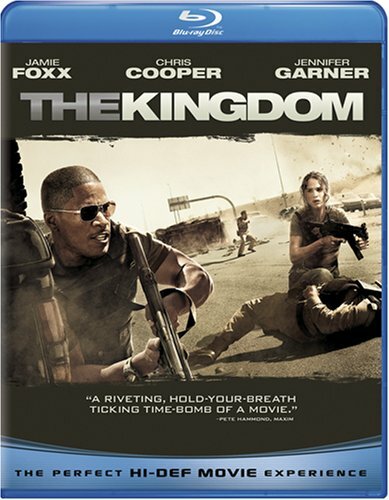 Peter Berg's The Kingdom does many things right but unfortunately it does many things wrong as well. As a political thriller/ police procedural it hits many of the right notes. It shows us that there are good people and bad people in all cultural situations. The first two thirds of the film are quite good. A terrorist organization has attacked an American workers compound in Saudi Arabia and an elite FBI response team must get into the secretive country to find the criminals who planned the attack. The American team is led by Ronald Fleury (Jamie Foxx) and includes a forensic expert (an underused Jennifer Garner); an intelligence expert (Jason Bateman) and an explosives expert(Chris Cooper). Once in country the team meets their Saudi counterparts Colonel Faris Al Ghazi (Ashrof Barhom) and Sergeant Haytham (Ali Suliman). The two groups begin to build a relationship of trust that allows them to go after the terrorist leader and bomb maker, Abu Hamsa (Hezi Saddik). Perhaps the geatest flaw with the film is that its last third becomes nothing more than an extended gun battle that wraps things up too easily for my tastes. The film ends on a note that the violence will continue as both sides are entrenched in a kill them all attitude. As stated Berg does any things right in this film but it could have been much better. I viewed the HD disc that had excellent picture and sound. The special features included three deleted scenes in HD, an extended featurette on the car crash sequence, a detailed making of the film featurette, a timeline on events in the Middle East, and an excellent commentary by Berg. From its opening scenes, depicting the Kingdom of Saud and its turbulent modern history following the discovery of oil in its barren deserts, THE KINGDOM sets the table for a white-knuckling political/cultural thriller. And director Peter Berg (so outstanding with 'Friday Night Lights') delivers a keeper, as an elite FBI team of investigators travels into the American compound in Riyadh to investigate the recent slaughter of numerous U.S. citizens--ostensibly perped by terrorists. Berg successfully sets the pace, tone, and tension between the FBI team and their Saudi hosts, then moves the viewer full tilt into a hair-raising climactic action sequence that never takes its foot off the gas. The cast is topnotch, headlined by Jamie Foxx as the FBI field commander. Foxx is tough, no-nonsense, machismo, yet periodically lets down his guard to show a rippling of emotion and compassion. Jennifer Garner plays the investigative team's forensics expert (and plays it convincingly), while FBI specialists Chris Cooper and Justin Bateman get to share the film's best lines. Country crooner Tim McGraw is impressive in an extremely emotional cameo role, yet this cast is most enhanced by the performance of Ashraf Barhom. Playing a Colonel in the Saudi national police--a Colonel in charge of the team's security--Barhom represents the contrast between his Arab culture and the West. The tension is established from the onset, yet the story delves deep enough into Barhom's character to reveal a humane man with only the best, most honorable intentions. This is a brutal, violent film--a film with an ending that will definitely raise eyebrows. Yet when it comes to heart-pounding action, intrigue, and suspense--with a story that sprints to the finish line--THE KINGDOM is a thriller as good as it gets. The camera should love its subjects in a film, and it does here. Hovering over shoulders, shooting through doorways, scoping around corners is what DP Mauro Fiore does best, and although it's overused (particularly in television commercials) here it succeeds in breaking down the 'fourth wall'. If you're a fan of Michael Mann (Collateral, The Insider, Heat), you'll recognize strategy of getting in tight and close on the principals. Mann is, in fact, one of the film's three producers. Director Peter Berg's camera gets close and stays close throughout the production that blends political thriller with action in a convincing, moving way. Berg also did a great job of interpreting writer Matthew Michael Carnahan's script. Most commentators have made much of the action, which, in the last third of the film, ramps up appreciably and really gets the adrenaline pumping. However, what is most interesting in the movie was the workaday banter of professional crime investigators. Writer Matthew Michael Carnahan takes care of characters that are at times world weary, cynical, trenchant, earnest, and committed. If the film has a weak point, it's the bad guy. 'Abu Hamza', a radical bomb maker and insurgent organizer, is the film's antagonist. He seems to represent the sum of all terrorist bad guys, and Jamie Foxx's Agent Fleury is left to ham-handedly inquire, "Is this the work of Abu Hamza?" For a script that's sophisticated in general, it's a let down that terrorist agency is represented by a single character, rather than contextualized as part of a diffuse, cellular organization all the more terrifying because of its decentralization. The movie tries to explore the tenuous US-Saudi relationship but thankfully leaves it at a superficial exploration of conflicting state interests. In other words, we don't have to suffer through Jamie Foxx mounting any soapboxes about it. This was a wise move. Consider having to listen to a b-list actor like Robert Redford deliver WWO (World Weary Opines) in things like "Spy Games" or "The Last Castle" and you'll see what indulgent commentaries can do to a movie. Considering the mainstream audience for which this film was intended, and its political subject matter, Carnahan/Berg could easily have been derailed into just such a jejune 'commentary' piece which would have gotten lost among the tremendous action of the final third of the film. Jamie Foxx plays the American FBI investigative lead. Jason Bateman stands out surprisingly, which was a great surprise--ironic and glib, he's the obvious "Gen X" spokesman who provides entree into the team for the audience. Jennifer Garner (for whom I had no hopes) disappears into the background and does, I thought, a good job. It was a risk to cast her, I thought, because although she can be convincing physically, she could come off as The Pretty Girl, or the Pretty Girl Who's Tough and Smart if her lines aren't written well. Chris Cooper stars as the FBI bomb tech investigator. Cooper is used well in this role, which calls for a "crusty" type, but neither Cooper nor his role offer any surprises: it's a workmanlike performance from a workmanlike role. Pay attention to Ashraf Barhom, who plays the Saudi protagonist, police colonel Faris al-Ghazi. I really liked him a lot, and would like to see him in productions that don't resemble what IMDB.com has as his latest role. Writer Carnahan sets up an uneasy and unfriendly relationship between the two investigative leads and develops it at a convincing pace. This is a potrayal of the work that men do in trying circumstances, and succeeds on the back of its skilful characterization. One quirk as a film fan: I always like good title design in a movie. When you think about "old school" titles, you often wonder what there was to design! The opening titles here blend stock footage, archival news reports and documentary work (you will recognize PBS/Frontline voice talent Will Lyman in voiceover) and bring the audience up to speed very quickly by exploring (in about sixty seconds) the history of the US-Saudi oil relationship. I thought that was really well done. The art direction/production design is of uniformly high quality. Shot on location in Abu Dhabi, with much principal A unit photography done in Mesa, Arizona, the art and production design is totally believable. Sound design--crucial in action scenes--is also really well done here. AKs sound like AKs, and M-4s sound like M-4s. The special features section of a well-produced DVD press can be a treat, or "Film School in a Box" as a friend puts it. Jason Bateman's commentary in the 'special features' is quite funny. I haven't watched Berg's director's commentary just yet. Overall, this film is very entertaining, and certainly worth your viewing as a rental. I'd purchase it if Berg's commentary is good. The powerful history of the United States' involvement in the Saudi Arabia flashes on the screen before the opening credits, creating a direct line from the past to the present day antagonism, and these moments are the most affecting ones of this political thriller. Jamie Foxx plays an FBI agent in charge of a small band of agents (Jennifer Garner, Jason Bateman, Cris Cooper) investigating, without State Department approval, a Saudi bombing which has cost the lives of one of their friends and hundreds of civilians. During the investigation, they are watched over by Saudi policeman, Faris Al Ghazi (Ashrof Barhom), a man assigned to control their every move in the spirit of protection. Of course, this being a Hollywood thriller set in Saudi Arabia, the Americans take matters into their own hands to overcome bureaucracy and corruption and to pursue the villains. Barhom plays his character with real humanity, and he steals every scene with his no-nonsense approach, tinged with idealism and hope for real justice. The Americans all do competent acting jobs, although their roles seem too predictable given the plot. The chase scenes are heart-stopping and somewhat over-the-top, but they keep this fast-paced flick moving from first moments to last. The message driven home, that we are two peoples fighting and corrupting future generations, is laid over-the-top of what is an essentially go-blow-up-the-bad-guys plot. Nuances such as diplomacy, culture, and history are quickly lost in the gunfire. Certainly, this film entertains the way the best in the genre does; however, it tries too hard at times and not hard enough at others. I recommend this for a one-time viewing. But really, couldn't this be a good TV series? Bring back (really they must!) Ashrof Barhom's character (with him playing it of course)(just write it as his death was faked) - put him on as an adviser to the team - defintely keep Chris Cooper's character (with Chris Cooper playing the role of course) - maybe he would be better as the leader of the team - fly them around the world as a special FBI team - punch up Janet Mayes - more cultural stuff - (with or without Jenifer Garner in the role - there are others I am sure who would be ok in the role but Jenifer Garner did a fine job as a sort of tough-guy Wonderwoman/Ripley(from Aliens)character) and we could see Adam Leavitt (with or without Bateman) be a lot more sophisitcated and involved with computers and wise-cracking. Wouldn't a TV series with Chris Cooper and Ashrof Barhom be a smash hit - maybe they wouldn't be open to doing a TV series (movie careers and all that)but there really seems to be a lot of potential here for the small screen. It could still be called The Kingdom - just send the team into assorted Mid-east countries with Ashrof Barhom's character as the guide and adviser. With all CSIs rapidly self-destructing - there is really an opening for just this kind of series! Want a better understanding of why the middle east hates the US? 5 stars for pure entertainment value, 3 and 1/2 stars actual Artistic Quality. What can I say, go into this one with low expectations as I did, and you should find it a great way to kill 2 hours. Yep there are some stock Hollywood cliches especially during the somewhat slowish first 1/3, but the fight scenes of the last 1/3 of the film makes it all worth it, despite their fairly egregious implausibility. So suspend your considerable disbelief, and just kick back and enjoy the freeway chase, the neighborhood shootout and the apartment shootout especially the part featuring World Class Hot Babe Jennifer Garner putting a four inch blade into the back of some big burly A-rab's jihadi skull after he throws her around the room like a bag 'o potatoes. Along the way, there are some vague jabs at insight: we see that the Washington DC political establishment is very much in cahoots with the Saudi royals and that the Saudi royals are an equally dubious bunch; that the American diplomatic corps has no shortage of greasy careerist slimeballs; that the average American and the average Saudi both view each other's governments and cultures with comparable amounts of distrust and xenophobia, probably well-deserved; that both countries are in bed with each other for the same bottom-line economic and military conveniences, etc. All quite reasonable and salient points no doubt, hardly original of course---but as one noted film critic pointed out, this is sort of like the "...For Dummies" version of "Syriana." In other words, the geopolitical backdrop is just a cool frame for all the state of the art bang-boom-bam boilerplate. It's just loads of fun to watch the explosions and blood-splattering...I could watch the luscious Jennifer Garner running around in a snug and sweaty T-shirt with an automatic rifle in her hands dodging RPGs all day long! I want to review a purchase (company) that I recently bought a DVD from through Amazon. First of all let me say that I AM a Saudi. I saw this film a couple of days ago which gave me a fair expression at first but ended with a cruel judgment of Saudi Arabia and Saudi's as an inhumane violent society where anything barbaric can happen. I would've appreciated it if the director spent more time researching the country and looked at things from a broader more intelligent perspective. Saudi Arabia has one of the lowest homicidal rates in the world, and I'm pretty sure that the lag is due to the crimes that came along with foreigners, particularly southeastern Asians. Saudi Arabia has a very family oriented society, where you are "limited" in your actions towards what your family or tribe allows you to do. That is probably the main reason of peace among Saudis. Add to that that women are nearly invisible which abolishes passion crimes. The script (as always from Hollywood) contains exaggeration and stupidity. Like the ridiculous scenes about Alsuwaidi. I couldn't stop myself from laughing with my bros when I saw that seen. In fact it has somewhat turned into this "laugh seen" where I replay it each time I have a chance to get a laugh or two. The film does contain some positive segments though. It's a clearly high budget action flick with some insane special effects. If action is what your looking for then you'll enjoy this film no doubt. But if your looking to learn something new (and real) about Saudi Society or even Arabs, then look elsewhere.